Bandwidth throttling occurs when someone intentionally slows down your internet speed. Anyone with administrative privileges over the network who reduces the amount of available bandwidth is engaging in bandwidth throttling. When it comes to issues of censorship and net neutrality, the perpetrator is typically the internet service provider and/or mobile carrier. The first two cases can be remedied with a VPN. Short for a virtual private network, a VPN encrypts all of a device’s internet traffic and routes it through a server in a location of the user’s choosing. The encryption prevents your ISP and anyone else on the network from seeing the contents of your web traffic, while the server disguises that traffic’s destination. VPNs also mask the type of internet traffic; there’s no way for your ISP to differentiate between VPN traffic from a web browser or a BitTorrent manager, for example. If yours is the third case, there’s not much that can be done. Save for switching providers, your ISP will always know how much total data and bandwidth you consume. However, many VPNs can compress data before sending it in order to save bandwidth, which could lower your total data consumption. Some can block ads and other forms of unwanted traffic, saving your precious kilobytes. VPNs come packed with other benefits as well. They add a strong layer of privacy to everything you do online, preventing your ISP and governments from snooping on your activity. They secure wifi networks against hackers. You can use them to unblock geographically-restricted content. And they can uncensor the web in environments where certain content is blocked, such as corporate office buildings, schools, and even countries like China. Start by signing up and purchasing a subscription from a reputable VPN provider. 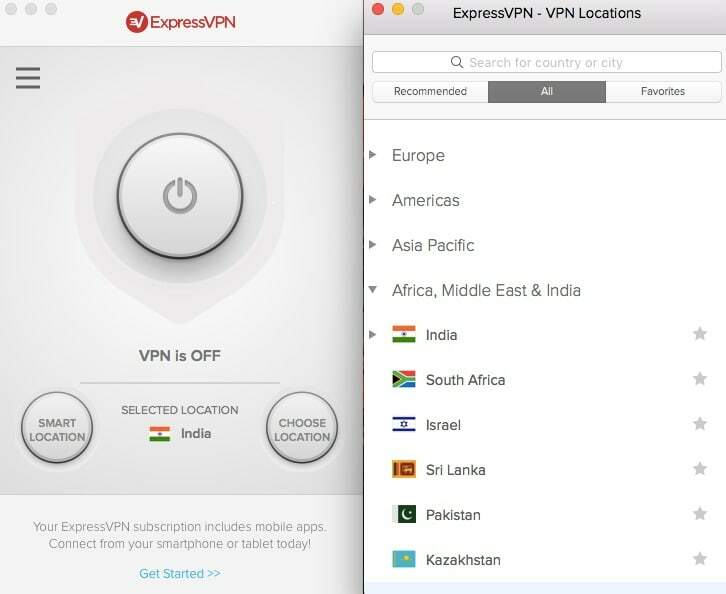 In this article, we’ll use ExpressVPN as an example. ExpressVPN uses top-notch encryption and perfect forward secrecy to keep your data safe. It stores no identifying usage logs or metadata. All traffic, including DNS requests that typically go through your ISP, are routed through the company’s global network of servers. Finally, it’s fast, so you won’t be changing one form of bandwidth throttling for another. Apps are available for Windows, MacOS, iOS, Android, Linux, and certain wifi routers. BEST VPN FOR BANDWIDTH THROTTLING:ExpressVPN is our #1 Choice. Leads the way with its easy to use no-fuss apps. It has a vast server network that is optimized for high-speed connections. Hard to beat on privacy and security. Works with all major streaming services. There is a 30-day no-quibbles money-back guarantee so you can try it risk-free. Once you’re signed up, download the client software to your device. After installation, ExpressVPN will require you to perform a one-time device validation, which means you won’t have to repeatedly re-enter your account credentials every time you start the app. With the app installed and running, you can either click the Connect button to automatically choose and connect to a nearby server, or click the option to manually select a location. Wait a few seconds for the connection to establish. You’ll receive a notification upon success. And that’s it! All your internet traffic will now be encrypted and routed through the VPN server. This should allow you to bypass most types of bandwidth throttling, as laid out above. How do I know if I’m being throttled? A simple speed test should be enough to ascertain whether your bandwidth is being throttled. Head over to speedtest.net and run the test. If you are getting speeds significantly below what your subscription promises, even at off-peak hours–then there’s a good chance you’re being throttled. If you think that a specific website or service is being throttled, this is more difficult to prove. You’ll need to monitor your network while using said website or service to see what sort of speeds you’re getting. This can be done on your device or wifi router if they have such a capability. Windows 10, for example, allows you to monitor network bandwidth under the Performance tab of the Task Manager. When testing, make sure no other devices in your home are eating up bandwidth. Check to see if you’re running any automatic backups, downloading software updates, or have contracted malware that’s using your internet. This depends on where you live. Countries with strict net neutrality laws ban the prioritization of traffic. ISPs in these countries are required to treat all traffic equally and cannot intentionally slow down or speed up specific websites, apps, or services. Bandwidth throttling is generally legal so long as the throttle applies to all traffic and not specific websites and services. The FCC’s Open Internet Order requires ISPs in the United States to treat all internet traffic roughly the same way. They cannot discriminate by application or service, device, or content. ISPs are categorized under the same rules as utilities when it comes to providing service. US net neutrality laws are currently under threat, however. The FCC under the Trump administration aims to dismantle the Open Internet Order and instead give the FTC regulatory power over these issues. Critics argue that the FTC will not be able to adequately protect consumers, however, and say the current law should be kept in place. ISPs want to remove net neutrality laws so they can provide faster access to products and services that benefit them, such as affiliated video on demand sites, while slowing down competing sites. Verizon was caught testing this sort of throttling as recently as July 2017. They could also charge other companies for fast lane access on their networks. As part of the EU’s Digital Single Market, ISPs cannot block, throttle, or discriminate of online content, applications and services. Due to Brexit, however, the future of net neutrality in the UK is uncertain. Prior to the EU law taking effect in 2015, the UK used a voluntary system to keep net neutrality in place. But once the UK leaves the Union, the current law could be scrapped. And since the majority party doesn’t have the greatest record of protecting citizens’ digital rights (see: the snooper’s charter), there’s a possibility that bandwidth throttling could be on the UK’s horizon. Related: The best VPNs to protect you from the Snooper’s Charter. Canadian ISPs are known to throttle bandwidth of certain protocols. These protocols are detected using deep packet inspection, which identifies the type of traffic traveling through its network. This can be used to reduce the speed of things like peer-to-peer filesharing, which use up large amounts of data and bandwidth. This is sometimes implemented during peak usage hours. Canadian ISP Rogers has been known to degrade the speeds of all encrypted traffic, which would include VPN traffic. Australian ISPs are known to engage in zero rating practices, but not so much bandwidth throttling. Due to a more competitive market, it’s not in their best interests to prioritize traffic. The country has not enshrined any actual laws or regulations that prevent bandwidth throttling, however. Related: What is the best VPN for Australia? Zero rating is similar to bandwidth throttling but unfortunately cannot be fixed with a VPN. Zero rating occurs when the ISP doesn’t count traffic to certain websites or services against the user’s data cap. For example, if AT&T customers allowed customers to stream videos from HBO Go without expending their monthly data allotment, this would be zero rating. Laws and regulations are less clear about zero rating schemes, but net neutrality proponents are against it. They say it creates an unfair advantage for established players and prevents startups and small businesses from gaining a foothold, thus stifling innovation.